The Fall Season Begins September 2! Register Now to Secure Your Team's Spot! Registration takes less than 5 minutes, is due by August 19, 2018, and space is limited -- our spring season SOLD OUT!! The cost for early registration before July 4, 2018 is only $1200 per team. Regular registration after July 4 costs $1700 per team. 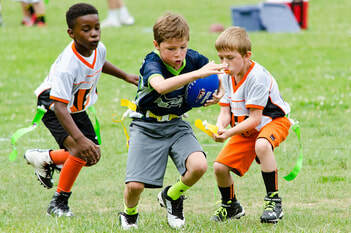 All teams are placed into divisions by grade level groupings of K-2, 3-4, 5-6, and 6-9. Teams registrations are accepted as is, but free agents may be added to provide competitive balance. Each division has playoffs and a Superbowl champion with individual medals for each player from the winning team. 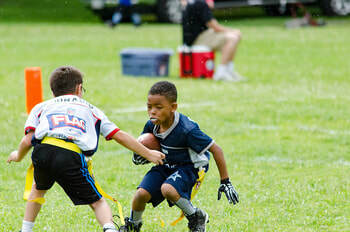 NFL Flag is the premier youth flag football league for both boys and girls, and our program provides young players a fun and exciting opportunity to engage in non-contact action while learning lessons in teamwork. The program is designed to educate young people about football, while emphasizing participation and sportsmanship. Players learn skills and lessons that help them succeed both on and off the field. Sign up a whole team for our fall season now - Our spring season sold out! Want to sign up an individual player instead? Click here. DISCLAIMER: If your child registers for the league, the fee to play on a team is non-refundable. By signing below, you confirm that you have read and agree to the League’s Waiver and Release of Liability Form, and that you consent to the use an online signature such as that provided here.